Easy reader for starters in symplified characters. Cow loves noodles. She ate through her whole stock and yet she would do anything for more. Would her friend Craig have noodles? And would he be angry if she ate them? 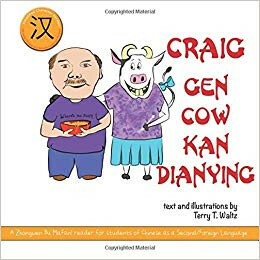 This is a book from the Zhongwen Bu Mafan! series. A series of books with less than 100 unique characters per story . The characters are printed in colours that indicate the tones of the words. 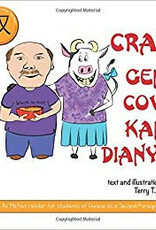 The stories are easy to understand, funny and recognizable. Ideal for absolute beginners. 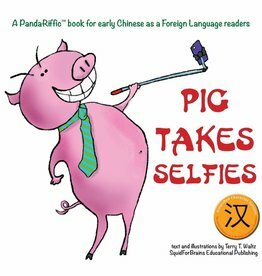 You can start using this book after just a few lessons, to be read individually or with the class. It is an easy book to ask about and reuse the words and sentences again and again. If you would like to order a set of books for use in your class we can offer a discount of 10% for a minimum of 20 copies of the same title. Please order timely and by e-mail as our supplies are limited. Delivery of larger quantities will take two to three weeks. Note: All the materials are copyrighted, which means that it is not permitted to make copies for use in the classroom. 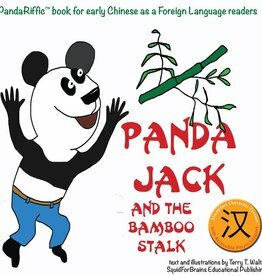 Panda Jack's family is feeling the economic crunch, but he's an enterprising sort...can he manage to trade the family cow for something that will keep them fed for years to come?